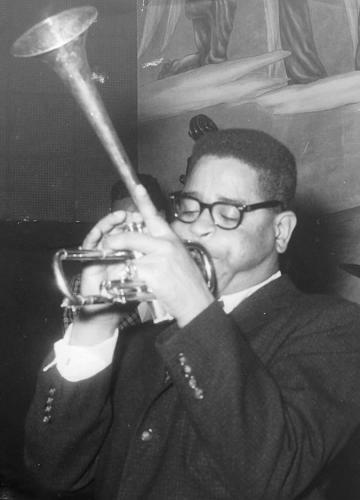 Jazz great Dizzy Gillespie had a long and distinguished musical career as a trumpeter, composer, and bandleader. Unlike many jazz musicians whose lives were cut tragically short, Gillespie’s career spanned the 1930s to the 1980s, from the big band swing era of the 1930s, through 1940s bebop, the Afro-Cuban jazz of the 1950s, to the recording in 1989 – when he was 72 – of his United Nations Band performance “Live at Royal Festival Hall.” He is one of the most influential musicians in the history of jazz, is considered one of the founders of modern jazz, and with Charlie Parker is credited with the invention of bebop. Gillespie was born in 1917 in Cheraw, South Carolina, the youngest of nine children to James and Lottie Gillespie. Son of a bricklayer father who was a part-time musician, he began playing the piano at age four. In 1932 he won a scholarship to North Carolina’s Laurinburg Institute, where he practiced the trumpet and piano. He left school in 1935, joining his family who had moved to Philadelphia. In 1937, after moving to New York, he made his first recording by age 20, playing trumpet in the Teddy Hill Band, and toured in Great Britain and France. He joined the Cab Calloway Orchestra in 1939, but was fired in 1941 after an altercation with Calloway. He also played with the big bands of Fletcher Henderson, Earl Hines, and Duke Ellington, and became the musical director of Billy Eckstine’s band in 1944. Gillespie married his wife Lorraine in 1940. The union lasted until his death. Gillespie and Charlie Parker (on saxophone) started playing together in the 1940s in New York clubs, developing a fast, complex, and improvisational style that came to be known as bebop. He was one of a group of musicians including Thelonious Monk, Kenny Clark, and Bud Powell, who would gather at Minton’s Playhouse in Harlem, New York City. With Parker, Gillespie recorded many bebop classics such as “A Night in Tunisia,” “Hot House,” and “Salt Peanuts.” Gillespie and Parker were both in the famous recorded 1954 concert “Jazz at Massey Hall,” with Bud Powell, Charles Mingus, and Max Roach. By the late 1940s, Gillespie had begun leading a band that combined bebop with Latin elements; he was the first jazz musician to give a major role in his music to an Afro-Cuban sound, and fuse Brazilian and other Caribbean as well as Afro-Cuban influences with jazz. In this genre, “Tin Tin Deo” and “Manteca” are notable. In his later years, he became an American ambassador of music, leading State Department-sponsored tours to Latin America and the Middle East, even playing with a snake charmer in Pakistan. He appeared in the sextet Giants of Jazz in 1971-2, an all-star band which included Thelonious Monk and Art Blakey. Dizzy Gillespie was the quintessential “hip” bebop musician, with his dark glasses, black beret, and goatee. He also was noted for his distinctive trumpet, with the bell turned upwards. In 1953 his trumpet became accidentally bent when someone fell on it; he liked the sound, and afterwards continued to play with a bent-up instrument, which became his visual trademark. His autobiography To Be or Not to Bop: Memoirs of Dizzy Gillespie was published in 1979. After a long, successful, and influential musical career, “Dizzy” died in Englewood, New Jersey on January 6, 1993. Susan Altman, The Encyclopedia of African American Heritage, pp. 100-01 (New York: Facts On File, Inc., 1997); Charlotte Greig, Icons of Black Music, p. 55 (San Diego: Thunder Bay Press, 1999); Paul de Barros, Jackson Street After Hours, pp. 25, 108, 113, 175 (Seattle: Sasquatch Books, 1993); http://www.allaboutjazz.com; http://www.afrocubaweb.com; www.pbs.org/jazz.